This programme only runs part-time by night. An Information Evening will be held on Wednesday 5th September at 18:30 in IT1 (Library Building), all are welcome to attend. 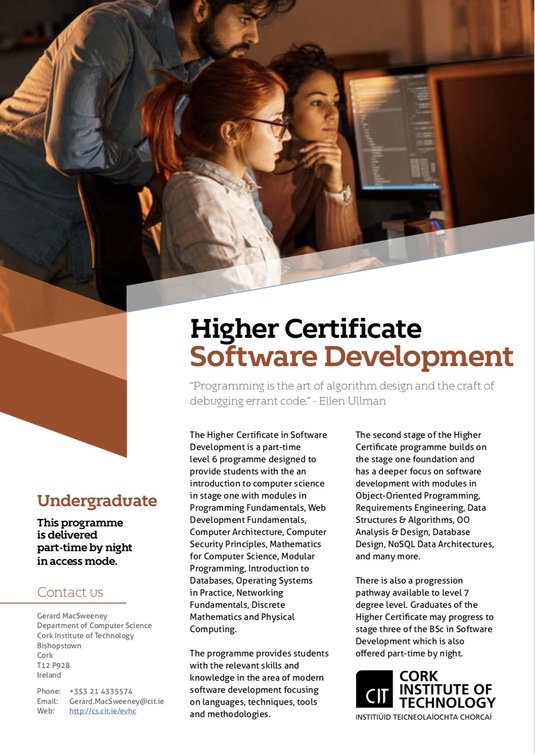 The Higher Certificate in Software Development is a part-time level 6 programme designed to provide students with the an introduction to computer science in stage one with modules in Programming Fundamentals, Web Development Fundamentals, Computer Architecture, Computer Security Principles, Mathematics for Computer Science, Modular Programming, Introduction to Databases, Operating Systems in Practice, Networking Fundamentals, Discrete Mathematics and Physical Computing. The second stage of the Higher Certificate programme builds on the stage one foundation and has a deeper focus on software development with modules in Object-Oriented Programming, Requirements Engineering, Data Structures & Algorithms, OO Analysis & Design, Database Design, NoSQL Data Architectures, and many more. The programme provides students with the relevant skills and knowledge in the area of modern software development focusing on languages, techniques, tools and methodologies. Click this link or the image above to download the programme flyer which contains links to the complete list of modules. Please click here or the programme schedule button for full module details. Potential areas of employment include working as a Software Developer, Software Tester, Software Support Engineer or Database Developer, to name but a few career possibilities. For testimonials from previous graduates, please CLICK HERE. Graduates of the Higher Certificate may progress to stage three of the BSc in Software Development programme which is also offered part-time by night.